There is a time in every recovery when this book will be a lifesaver. Sponsors are one of the little miracles of Alcoholics Anonymous. A sponsor is an amalgam of teacher, guide, cop, friend, role model. The direct, realistic, honest and straightforward way sponsors have of making sense out of the complex business of recovery is like a splash of cold water in the face--refreshing, jarring, but always to the point and always helpful. 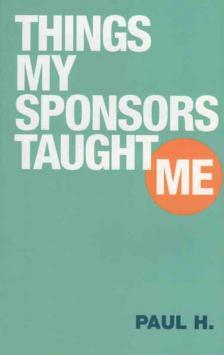 Things My Sponsor Taught Me is dedicated to just that kind of sponsor. With gratitude and strong affection, Paul H. draws upon the wisdom of his two sponsors, Harve F. and Bob M. Filled with the bottom-line basics of how A.A. works and written in layman's language, Things My Sponsor Taught Me provides the specifics, based upon the general guidelines in A.A.'s Big Book, of how one man, his sponsor and the A.A. fellowship work together for recovery. Literally bursting with A.A. philosophy, quotes, slogans and refreshing reminders, Things My Sponsor Taught Me contains a table of contentsthat makes it easy to look up specific topics and find informative, encouraging, realistic advice. Sponsors and sponsees alike will benefit from this encyclopedic handbook on recovery that has a message for anyone who follows the A.A. way of life.